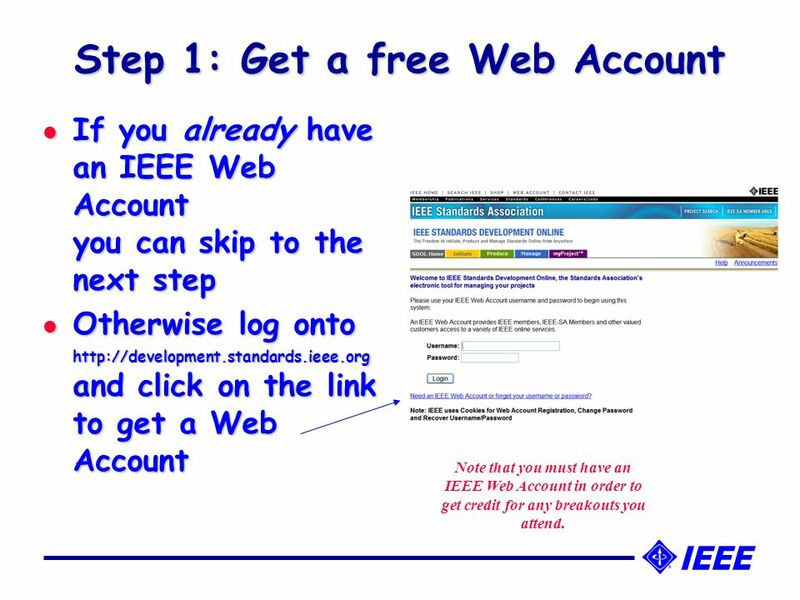 3 l If you already have an IEEE Web Account you can skip to the next step l Otherwise log onto http://development.standards.ieee.org and click on the link to get a Web Account Step 1: Get a free Web Account Note that you must have an IEEE Web Account in order to get credit for any breakouts you attend. 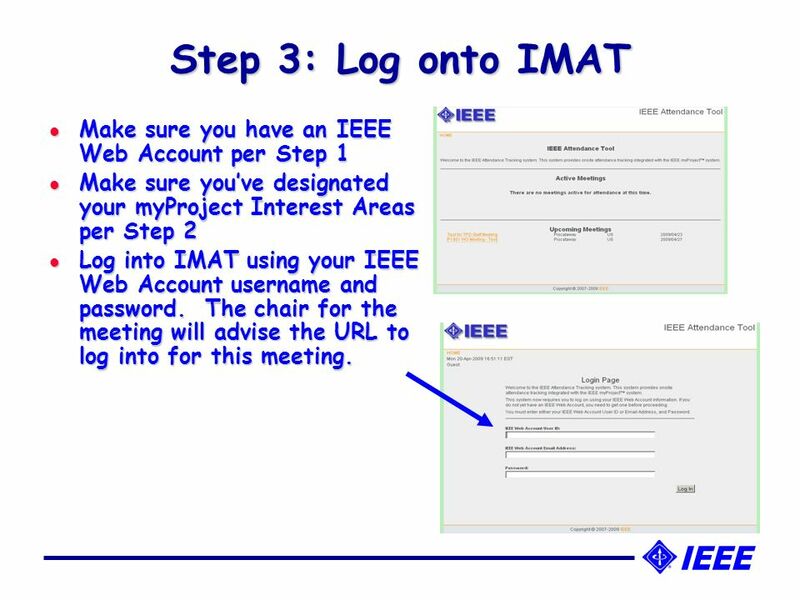 5 Step 3: Log onto IMAT l Make sure you have an IEEE Web Account per Step 1 l Make sure youve designated your myProject Interest Areas per Step 2 l Log into IMAT using your IEEE Web Account username and password. The chair for the meeting will advise the URL to log into for this meeting. 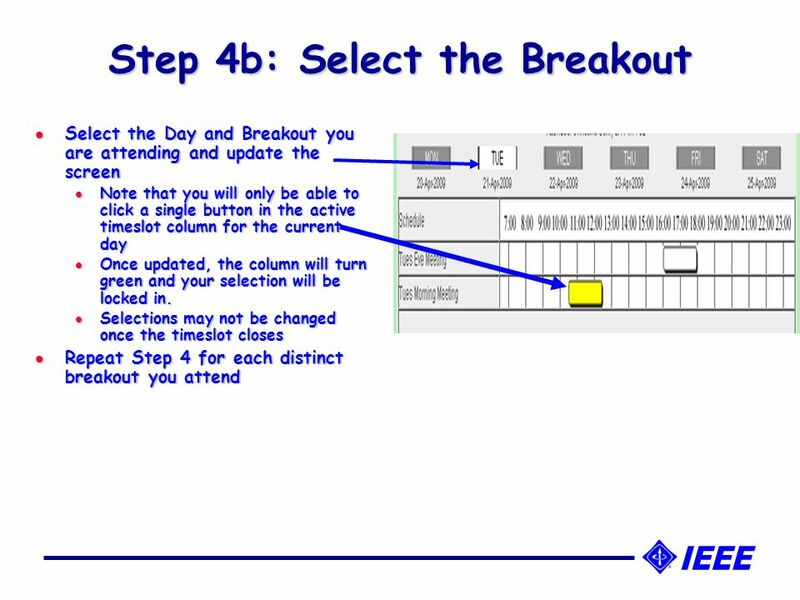 6 Step 4a: Register Your Attendance l Select the WG or option from the home page. 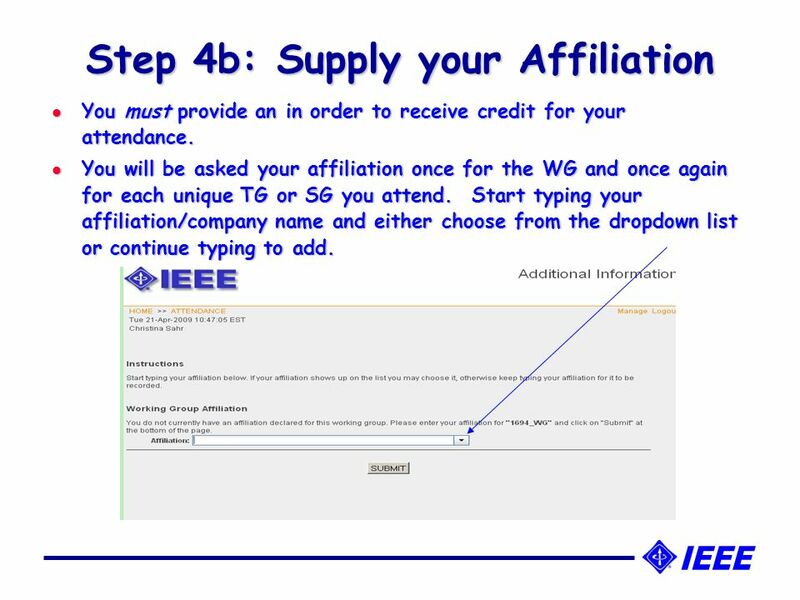 8 Step 4b: Supply your Affiliation l You must provide an in order to receive credit for your attendance. l You will be asked your affiliation once for the WG and once again for each unique TG or SG you attend. Start typing your affiliation/company name and either choose from the dropdown list or continue typing to add. 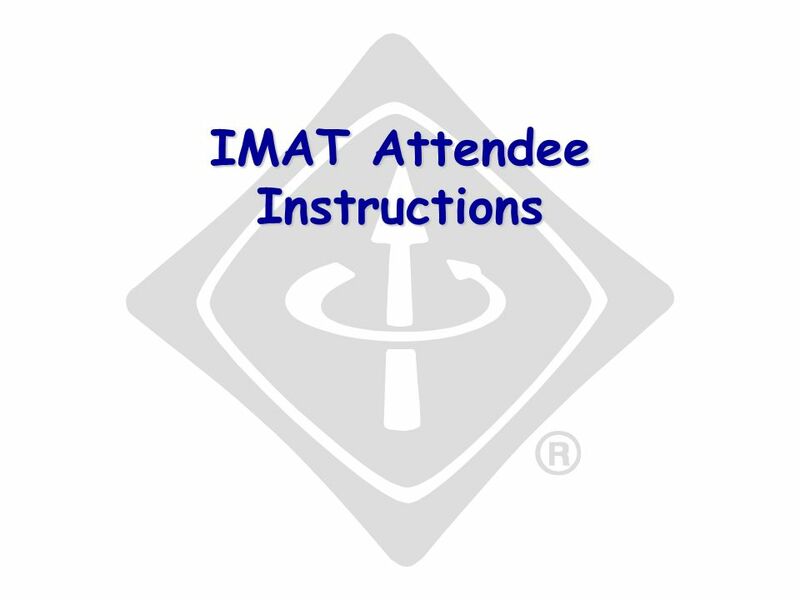 Download ppt "IMAT Attendee Instructions. 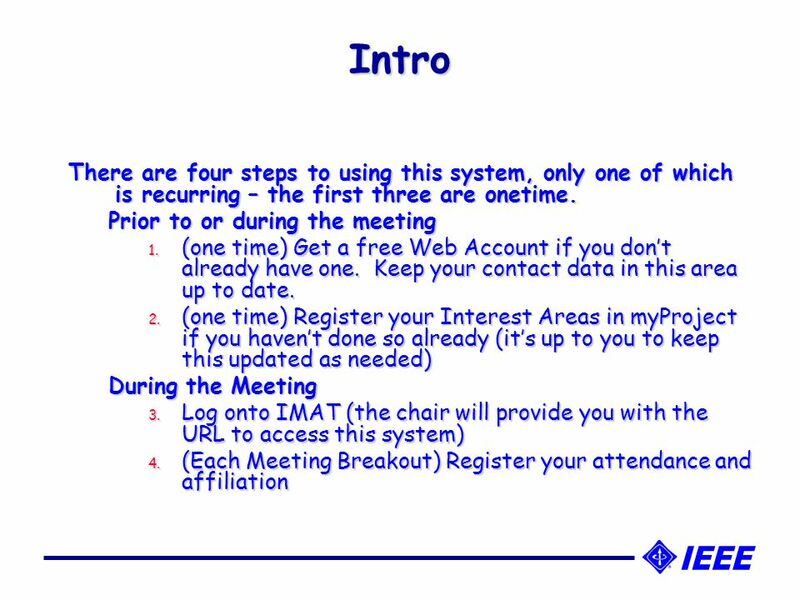 Intro There are four steps to using this system, only one of which is recurring – the first three are onetime. Prior to or." Joanna Cooksey, Subject Librarian Oxford Brookes University Logging into Athens: a brief guide. LEARN Session September How to find, read and interpret your IT invoice Accessing the IT Billing Portal Reviewing Reports Interpreting your IT Invoice. UO Academic Extension Online Registration Instructions and help. 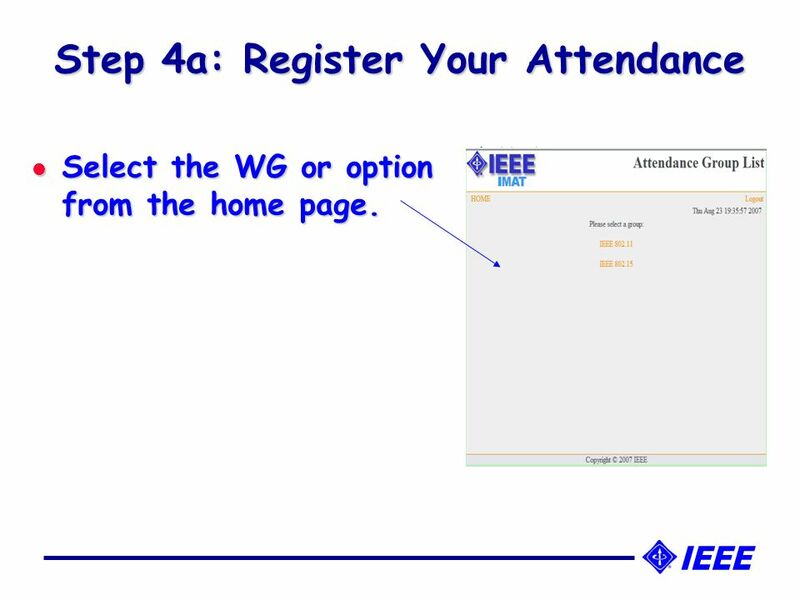 IEEE Standards Association Logging and Viewing Meeting Attendance Using The IEEE Attendance Tool. File Activity Tracking Format S ystem Manual A Real Estate and Relocation Services Aggregator Presented by BHIF Group Click On The Flag To Begin Or Press. 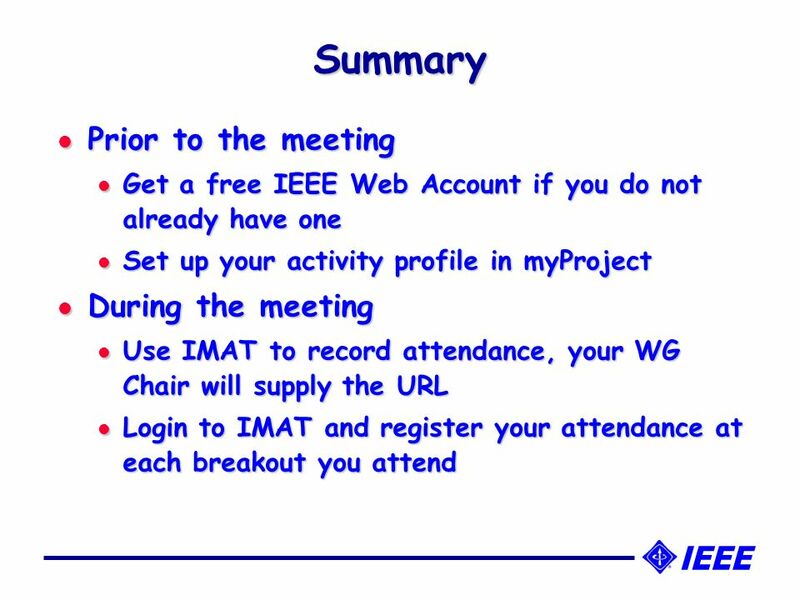 IEEE Standards Association Attendance Tool Manager Access. Domino’s Pizza Online Order Form. Design Usable by anyone familiar with a web browser and using the Internet. Usable by anyone familiar with a web browser. Edit the text with your own short phrases. 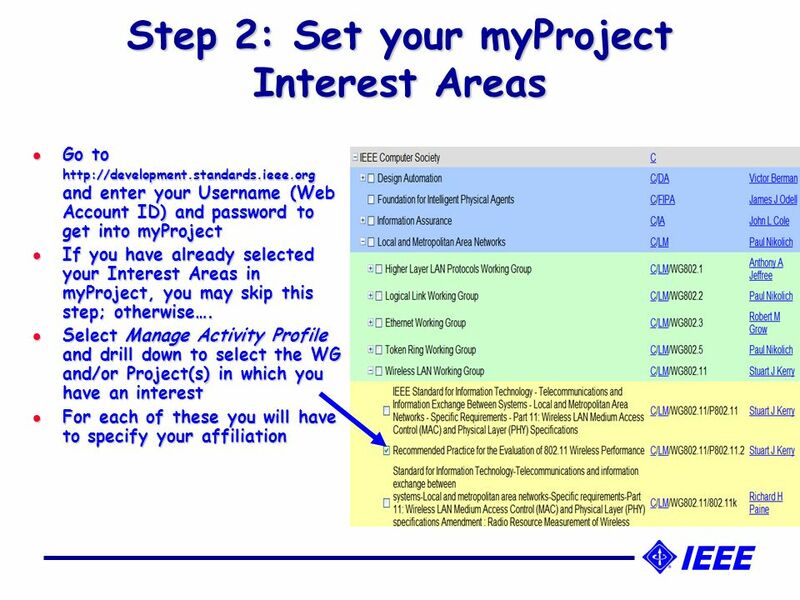 The animation is already done for you; just copy and paste the slide into your existing presentation. RegisterLogin. Updating User Information Password – use this field to change your own password Confirm Password – retype the new password for verification purposes To. MyBCommLab First Day of Class Registration Walkthrough.